The Black Crowes - Before the Frost...Until the Freeze - This new album from the veteran blues rockers is a proper studio release of new material, but was recorded in front of an audience of the band's fans. These United States - Everything Touches Everything - The third LP from this D.C.-based buzz band, available to stream in full via Buzzgrinder.com. Robin Guthrie - Carousel - The former Cocteau Twins guitarist - who has had massive influence on followers in the dream pop and shoegaze genres - is on a roll. His new release follows another album (Mirrorball) and an EP (Angel Falls) released earlier this year. Richard Lloyd - The Jamie Neverts Story - A collection of Jimi Hendrix covers from the former Television guitarist. 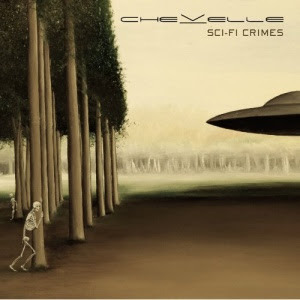 Chevelle - Sci-Fi Crimes - The fifth album from this widely-popular, Chicago-born hard rock band. According to a USA Today review, "Chicago's Chevelle hopes to change the way people see the band with its fifth album. Chevelle — a power trio that consists of (Pete) Loeffler, brother Sam Loeffler on drums and brother-in-law Dean Bernardini on bass — relies on neither the gimmicks nor the adrenalized anger rush of better known hard-rock acts to get them by." On Thursday, September 3, the band will be in their home city for three events: An induction ceremony at the Hard Rock Cafe at 1:30 p.m., a 30-minute set at 4:30 p.m. at LaSalle Power Co. for the first 350 fans who show up and buy the new record, and a private Q101 show (also at LaSalle Power Co.) in the evening. Click here for more info. Breakers Broken - Reset - For this new EP, this eclectic pop/rock trio expanded their sound by working with Chicago producers Doug McBride of Gravity Studios and Rick Barnes of Rax Trax. Get it here and check out the band live tonight, September 1, at Reggie's. Color Radio - Be Safe, Beware - A local four-piece centered on the talents of two brothers from Mexico City - Jonathan & Tohm Ifergan - with a flair for dynamics and a Brit-pop sound. The band is having a CD release show at the Empty Bottle this Wednesday, September 2 with Metavari and Flights.